The following list some QuickBooks Desktop conflicts our users have encountered, and those documented by our Support Team. Please find the conflict in the table below, then click the go to link for help in solving it! Go to QuickBooks returned an error when adding a [Customer/Vendor/Employee] record. A record with the name [Name] already exists in QuickBooks. If this record was accidentally duplicated, please delete the duplicate. Go to There was an error modifying the Customer list, element "XXXXXXXX-XXXXXXXXXX”. QuickBooks error message: This customer already has job information. QuickBooks returned an error when adding/modifying a ReceivePayment record. The error was "Object XXXXX-XXXXXXXXXX specified in the request cannot be found. Go to The error was "The transaction "is manually closed" field has an invalid value of 1." QuickBooks error message: The sales order transaction is already fully invoiced. Go to The item, [Name], cannot be deleted as it has already been used in transactions. If this item is rarely used, consider making it inactive in order to hide it from your item list. If you do wish to delete this item, try deleting the transactions related to this item in QuickBooks. To restore this item to Method, click on 'Refetch from QuickBooks'. This QuickBooks Desktop conflict normally occurs when a customer already exists in QuickBooks. To fix this, you can rename the duplicate so that it has a unique name, or delete one of the records. Click Customers > Customers and Contacts List. Choose the customer you'd like to edit and click Go to next to the chosen entry. At the bottom of the screen, you will see a More Actions button. Select it. This conflict is caused because while Method allows you to add a job to a customer with existing job information, QuickBooks rejects the data when it tries to sync. Here's how to clear this conflict! Let's assumetherelationshipisBobCrenshaw:Bill Tillman Painters,whereCrenshaw isthecustomerandBTP is the job. At this point there are two courses of action that can be taken to resolve the conflict. You can remove the job information listed in Bob Crenshaw under Payment & Job Info > Job information, then click Retry Sync to QB. Click Refetch from QB.ThiswilltellQuickBooks to override the relationship in Method with whateverislistedinyourQuickBooks file. In some cases, this may remove the relationship between Bob Crenshaw and Bill Tillman Painters. has already been paid in full via another payment record. The payment was created in both Method and QuickBookswhile the sync was not running. When Method tries tosyncthepaymenttoQuickBooks, it finds a duplicate payment! This is the most common way this conflict is triggered. The payment was created in Method and linked to the appropriate transaction, but was not synced with QuickBooks. The transaction was then deleted, but the payment remains. Faulty customization attempted to pay a transaction that was already fully paid. This issue applies only to Method accounts that have been customized. For more help with customization, please contact a Business Solutions Specialist. In order to fix this conflict, the user will have to determine whether the payment record is a duplicate, or whether the invoice balance has already been paid. If the payment record can safely be deleted, you can delete the conflict in your Resolve Conflicts screen (which you can access by going to QuickBooks > Resolve Conflicts). It is important that you do not delete any payment records until you manually check to make sure it is definitely a duplicate. Deleting records in Method cannot be undone. This conflict is triggered because QuickBooks rejects any attempt to close a sales order twice, which is what happens if Closed is still checked on a sales order. Clearing this conflict is very simple; here's how to do it! Navigate to Customers > Sales Orders. Use the Existing Sales Orders grid to locate the sales order that generated the conflict. Once you find the sales order, click on it to open its details to the right. 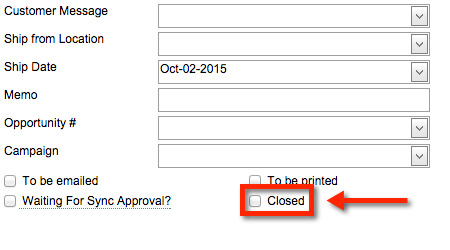 Uncheck the checkbox marked Closed. Click Save to save the sales order. As indicated in the error message, the item cannot be deleted because it is being used in a transaction. Before you can delete the item, you must delete the transaction first. However, if you tried to delete the item, you will need to restore it. In the tab links, Resolve Conflicts. Select Refetch for the item conflict you wish to restore. Now delete the transactions which contain the item, and then delete the item.